Park Entrance, 1887, Stanyan and Haight Streets. It is fitting that this tour should BEGIN AT THE CORNER OF HAIGHT AND STANYAN STREETS because it is around this intersection that the neighborhood developed. In 1868 the state set aside funds with which to purchase the land that is now Golden Gate Park. By 1870 a Park Commission had been appointed and a superintendent employed to take and landscape the sand dunes. By the 1880s the success of these efforts was apparent and Golden Gate Park was rapidly developing into the city's recreational center. The main pedestrian entrance to the park was at this intersection and thus it became the launch pad for park activities. On weekends it was not unusual for thousands of people to crowd the area. 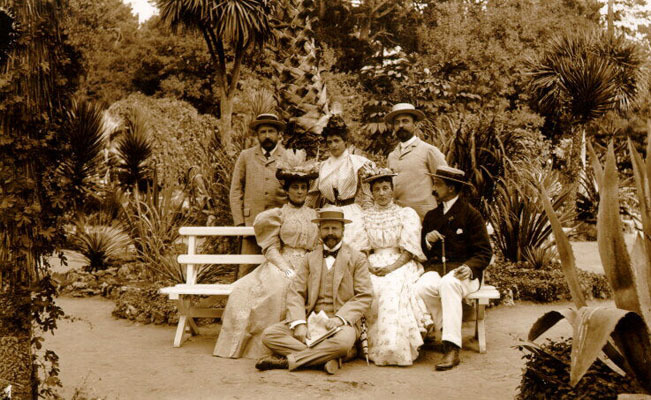 Unidentified group of friends in Golden Gate Park, 1880s. They came for the free Sunday concerts in the music concourse; to visit the elaborate playground at Sharon Lake; to sip tea at the Japanese Garden and to attend baseball games on the field on Frederick. Supporting businesses flourished along Stanyan Street. There were taverns, coffee houses, restaurants, billiard halls and even two hotels. 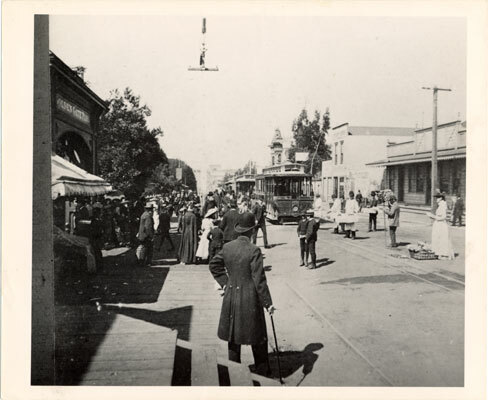 At the corner of Frederick and Stanyan passengers could board an open air train for a scenic ride along Lincoln Way to Ocean Beach. In 1895, an amusement park "The Chutes," opened on Haight Street between Clayton and Cole. It had as its only attraction a boat on rollers which dropped from a 60-foot tower into an artificial lake. In later years a theater, a railroad and wild animal exhibitions were added. 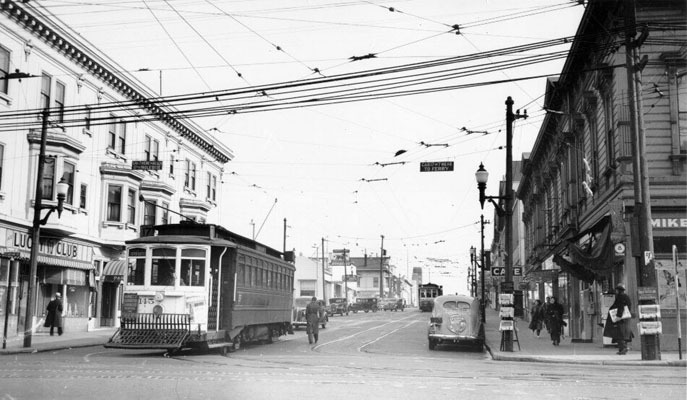 Streetcar turns around at Haight and Stanyan, 1940.